“Nothing short of brilliant . . . Carver has created a wonderful story here, sort of Jason Bourne meets Silence of the Lambs.” – Michael Jecks, author of Blood on the Sands. My first thought on reading Spare Me The Truth was one of total delight. I love discovering new authors and unexpected little gems, like this one. Spare Me The Truth starts with Dan Forrester, a man with partial amnesia. He is seemingly a normal everyday family man, who lost his memory following the tragic death of his son. One day he is approached by a woman from his past. Dan is thrown in at the deep end, looking for answers and trying to fill in his huge memory gap. Another thread follows police officer, Lucy Davies. Lucy becomes involved in a brutal case of kidnap and attempted murder.She starts to have a very personal interest in the victim, as certain facts come out. The final strand follows a GP, as she is drawn into a mystery of missing money and unexpected bereavements. The three parts slowly come together and are connected by a disturbing serial killer and medication for bipolar disorder. Carver knows exactly how to hook a reader and keep the tension going. Following our three very different characters, we soon start to see the big picture: International corruption combined with multiple murder, some very convincing manipulation through technology and the world of spooks. This reminded me why I love thrillers so very much. Addictive and high-paced, Spare Me The Truth takes three very different characters and winds them together in a very satisfying read. Following Dan Forrester, PC Lucy Davies and Dr Grace Reavy, the book starts by meandering through all of their separate lives, setting the scene, before really picking up pace as their lives and goals become more and more entwined. Weaving together the hidden world of spies with the more mundane activities of errands and childcare is a challenge in itself, but CJ Carver effortlessly brings them together, and the reader is completely swept along with Dan Forrester, as the high-drama, high-risk world he once inhabited catches up with him. I found a wonderful sense of terror in the realisation that everyone has been lying to Dan and that he can trust no one. The way the story roved around, bouncing from London, to the South West, out to India and then back again, reminded me of one of my favourite thrillers of recent years, I am Pilgrim (Terry Hayes). The characters are a strong part of the story and readers will share in their outrage, hesitance and moments of heavy realisation. I particularly enjoyed PC Lucy Davies’ character, both feisty and level-headed and really liked the portrayal of her as a strong woman in what might be seen as the ‘male-dominated’ world of the police force. 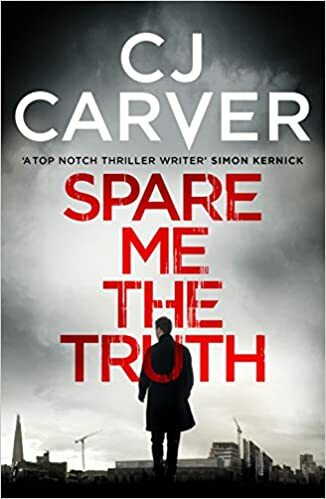 Spare Me the Truth is a fast and addictive thriller, an intelligently woven plot with multiple layers all coming together in bang on fashion right at the end. Just what I like. Beautifully written to be entirely engaging (and exciting) throughout with pitch perfect characters, a healthy dose of reality in amongst the fictional shenanigans and overall a stonking good read all round. Spooks and spies, always a good time – I was genuinely absorbed by the huge issues facing Dan as he realised everyone around him was lying and that his gaps in memory had not been filled with truth by those closest to him. In a wonderful mix up of family drama and underground political plot C J Carver builds the tension using a group dynamic that is highly intriguing, throwing different people from different backgrounds into the same boiling pot and then letting them simmer. Loved Lucy – struggling with her own personality and Grace, like Dan, realising her life has been full of lies. The story has some wonderful twists and turns, also adding some twisted murders, a half serial killer vibe that causes a shiver – although in Spare Me The Truth nothing is as it seems. I always have a great time with a book when I have no flaming clue what is going on, just that I MUST know so therefore I’m desperate to pick it up again. It helps when the writing is full of depth and beautifully descriptive as it is here, when it has characters you can root for and relate to, the emotional connection between reader and story is achieved in clever fashion. Overall loved it. More like this one would be good. Please. And bring Dan back. You know you want to by Liz Barnsley.